From Retro to Modern, Bringing Back the Blowout and How to Do it at Home. In the 1950’s, women visited their salon once a week to set their hair in rollers and have a style that would last several days. Those services were focused on neatly rolled sections, hood dryers, time to cool and lots of shellac. I was inspired by this genre after hearing my clients daydream about having someone at home to set their hair in the morning. I fashion my blow-dry class to mimic those classic sets. For now, I have only a few clients that will allow me to round brush their hair with all the volume and hairspray that my heart desires. This is a new generation with smoothing and shine on the front-line. Fortunately, “movement” in the hair has made a comeback and I take a lot of pride in marrying the old school techniques with trends of today. You can always benefit from my hands-on coaching, but I have a few key points that can help you at home. Product application has endless possibilities. We all have good hair days and bad hair days that may determine which products we choose. Use the shampoo and conditioner that best compliments your hair’s needs. Volume, style, smoothing, and hydration, etc. Every other product you add is contributing to the structure. Make a plan for your style by thinking of how each product can build on to this structure. Combinations can be layered or cocktailed. Consider the product’s use to determine where it should be applied on the section of the hair. Conserve your products by using them strategically along the strands of hair as well. For example, keep volumizers near the roots, polishes near the ends and styling products throughout the midstrand. This is generally speaking, of course. I have learned that some fine hair can use a finishing hairspray during a blow dry for a root lift. 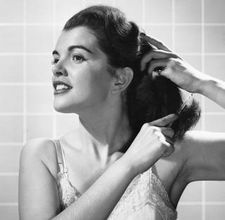 Try blow-drying a finishing polish into that frizzy part of the hairline that won’t calm down. Necessity is the mother of invention. You might be surprised at how many ways you can use your average product. This is the most entertaining part of the blow-dry class I teach. It’s always the most improved subject by the end of the class too. When it comes to sectioning, there’s a lot of slacking off that really sets you back. Do your self a favor and get a good supply of jumbo clips and duckbill clips. When you section, imagine drawing the line on your scalp. Twist and tuck the whole strand of hair into the area so you can avoid tangling that hair in your brush. Neat sections will save you time and avoid tangles and tearing of your hair in the brush. Breakdown the head into five major sections. Start with the top of the head and create a section centered around the part. This should be no wider than the brush you are using and it will be the last and most important section you do. Divide the rest of the head into four major sections. Blow-dry using subsections that are not larger than the brush you are using. Start at the bottom and work your way towards the top and the front of the head. When you are blow-drying the bottom section, just pay close attention to setting the ends since the rest of your hair covers the roots. Set the hair by thoroughly cooling each section with your dryer after it is heated dry. As it is cooling, set down your blow dryer (in a secure place where it won’t fall off the counter) and brush through the section several times while maintaining the shape. By doing this, you “freeze” that shape of the brush into the section. That what we call setting the hair. Repeat this all around the head and run a cool dryer once over using your hands to separate the section lines that may still show. Apply your favorite finishing products and celebrate a job well done…or another practice session survived. I always welcome new clients for blow-dry sets and for my Round Brush Techniques Class. You can find me at Urban Betty Salon, Monday – Friday and our front desk staff is available all week to answer questions about my services and classes.